I’ll tell you a little about myself (yawn). I’m Devyn, and I write about the characters that live in my head. 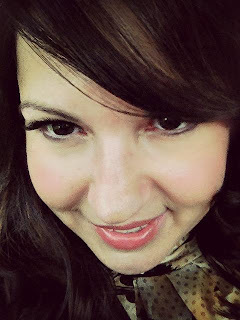 My passion is to read paranormal books, and to check out new authors. My preference is young adult books, on occasion I’ll read a grown-up book. In 2010 I completed my first full length novel. I self published it in June of 2011 and talk about not knowing what I was doing…I made all kinds of mistakes. In 2012 my Light Tamer series was published and has been on several Amazon Best Seller lists since July 2012. I could bore you to tears with my life working for a Fortune 500 company, or having a famous comedian father, not today. I’m a mother of two adult children, and as of Dec 29, 2012 I can add grandma to my titles. I write under a pseudonym, and at first it was hard to remember I’m Devyn, it is getting easier to remember. Thank you to everyone who has supported my books. As many know, I write for young adults, Sapphire is my first New Adult book. The characters are two adult characters in my book Malevolence. I received many requests to write their back story. In the beginning, I wasn’t certain about writing a racy book. It has been fun to write, and I’m excited to hear what the public thinks. 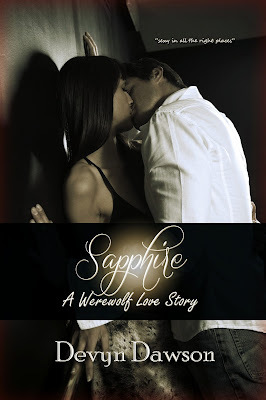 Devyn, welcome to IndieLicious and congrats on the release of your new book, Sapphire, A Werewolf Love Story. Sapphire is part of your Legacy Series and your first NA book, rated 17+. I've yet to be brave enough to dabble in NA, go Devyn! As an author of two successful series we are so excited that you have agreed to share some of your thoughts on writing. As an author can you offer any advice for beginners? Build your platform first. Read books like the one you’re writing, figure out what you like. Read reviews of books, get an idea what didn’t work in your favorite author’s books. Figure out what did work for them. Simple…I like simple. Do you become a character while writing? No, I don’t become a character. Some characters have my personality traits though. My favorite place to write is in my family room that looks out over the woods in my backyard. How did you come up with cover idea? Covers are usually something in the book. I like a mysterious quality to my covers. Your covers are very beautiful and mysterious. I love the new cover for Sapphire. How about an excerpt from the book? Will you give us a little taste? Walking into her house, I turn and notice a cat lurking around the corner. His tail twitches and ears fold back as it hunkers down behind a bush. I grin to myself every time I see a cat’s reaction to me. I take a deep breath, memorizing the surroundings like a mental photograph through smell. Her house smells like pine cleaner and vanilla. Her essence is everywhere, enveloping me in a big Sapphire bath of pheromones. Next, there’s her family, they are similar but different. Ruby smells like honey and eucalyptus, which is everywhere. If it were humanly possible, I’d imagine she’s rubbed her hands on every single surface of the house. Even if she has touched everywhere, I’ll always be able to distinguish Sapphire’s scent. Her brother Stone smells of the outdoors mixed with something spicy. I’m keenly aware of every move she makes, from the way she reaches for the glasses to the way she rubs her tongue across her teeth. My body is screaming to touch her…enjoy her…merge with her. The General is going to kill me when I tell him she’s human. It is frowned upon to mingle with humans in the ‘biblical’ way if our wolf is calling the shots. My wolf is fighting with me to accept the fact the General doesn’t need to know right now. Sure, we can have a good time, and even date humans, as long as we remember our duty is to our pack. Things would be simpler if we weren’t about to bring the Great Wolf to the farm. I’m not thinking about that right now. No, tonight I’m Parker...a man and my werewolf family will have to live without me for the night. Well, Devyn, I am definitely sold on this book and will download it ASAP! Thank you so much for stopping by IndieLicious and best of luck with your writing! Sapphire didn't want to go out, but after some coaxing from her sister, she agreed to go. It was that night, and the days to come that would awaken her sexual desire and her heart. Parker had never had a girl hold his gaze... most everyone wouldn't dare challenge him that way. She wasn't one of his kind though, she was human and against the rules. He knew her spirit was calling out to his wolf. His wolf was more than ready to answer that call. She was the one... he would kill for her, he would die for her, but would he disobey his alpha for her?